This summer may become known as The Summer We Moved Cows Constantly. This morning we moved some down with the heifers we’d tested and moved yesterday. There were only 30 pair or so… but they were brushed up on a point along the Nowood Creek. Back in the day, you could ride your horse through half of it, now it’s a hike… crawling over logs and stooping under branches. Neverfear, my English Shepherd was with me… or rather a bit ahead of me! This was perfect for him even though it was hot! He could always just jog over 20 yards, reach the creek, and lay down to cool off… at least for the first part of digging them out of the brush. 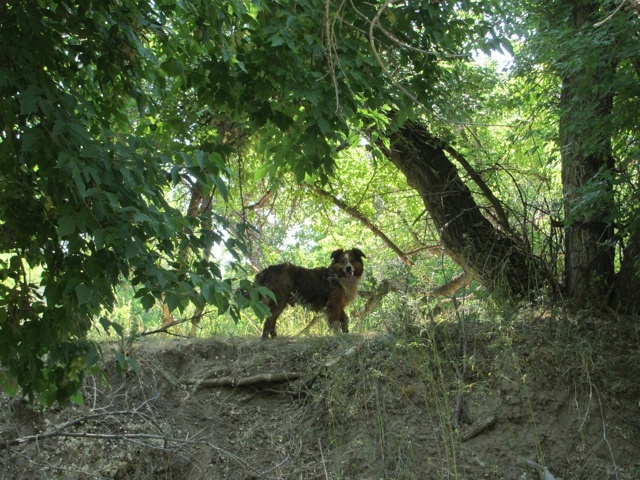 I, on the other hand, sweated and panted and huffed and puffed… and only *thought* about laying on my belly in the creek! Skinny dipping was not on the agenda!